Mini Healthy Banana Bread Muffins for Toddlers! Can cake mix be used for muffins? Yes, it can! 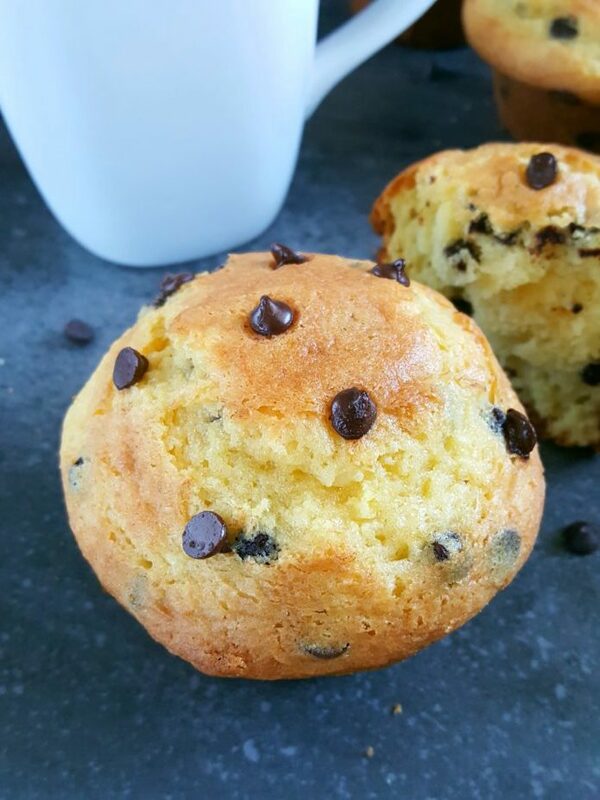 This recipe in particular is chocolate chip muffins made with yellow cake mix. Super easy to make, only 5 ingredients and ready in less than 30 minutes. As you can probably tell from this baking blog I’ve got going here, I enjoy baking from scratch. It’s great. And I love me some chocolate chip muffins for breakfast but sometimes I just don’t have the time to make them. This is why I always keep cake mix on hand because there are so many ways that you can use it as a shortcut and this easy recipe is a great example. It’s an easy shortcut recipe and a great way to improve cake mix! It’s just a really easy cake mix muffin recipe to have in your back pocket, especially when you’re short on ingredients. Who would’ve ever thought that you could get moist bakery style chocolate chip muffins from cake mix? By the way, this recipe fits in so well with the “theme” of this baking blog. It’s all about baking for beginners. Nothing complicated over here! 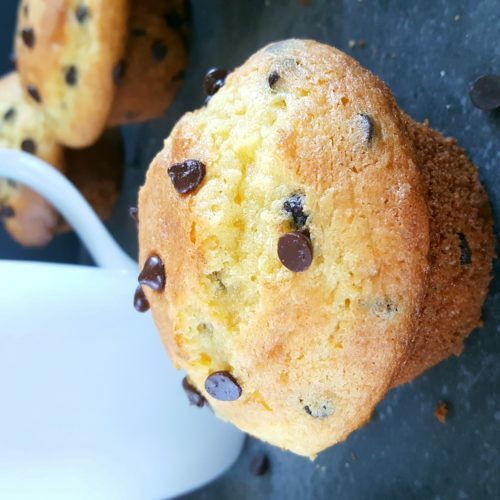 And in this post I’m going to show you how to make easy chocolate chip muffins and exactly how to use cake mix for muffins. If you’re wondering how to make cake mix muffins it’s quite easy. It doesn’t require much effort to convert cake mix to muffins. They’re made without baking soda or baking powder and all you need is one bowl and 7 minutes (or less) to mix it all together. Preheat oven to 350°F. Line muffin pan with muffins liners or spray generously with nonstick cooking spray and set aside. In a large bowl combine the butter, eggs, and milk. Add the cake mix and gently stir until incorporated. Fold in the chocolate chips. Scoop batter into the muffin pan filling the cups to the top. Bake for 18 – 20 minutes until a toothpick inserted comes out with a few moist crumbs. Cool in pan 10 minutes then remove to cool completely. From cake mix to muffins just like that! I love that I didn’t have to bust out my big old bag of flour for this recipe. And I love how easy and adaptable this recipe is. I think that I may like cake mix breakfast recipes more than I should. 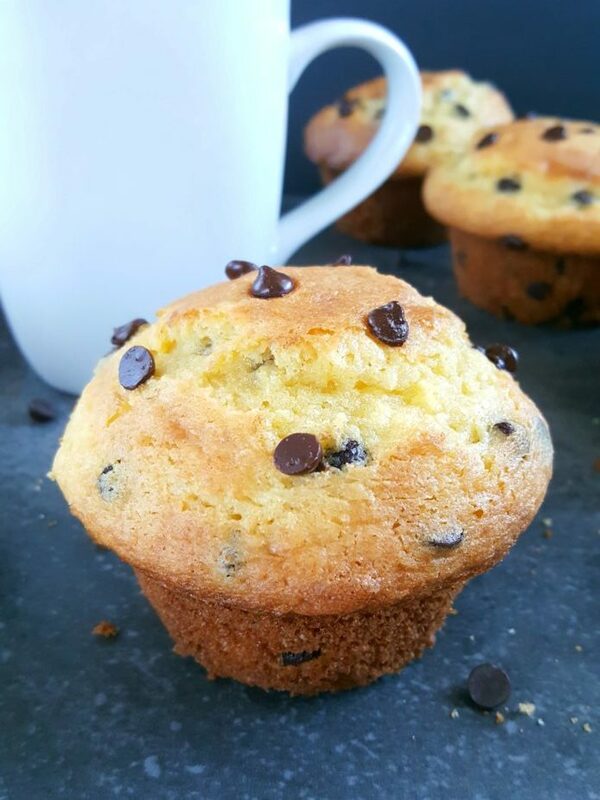 This cake mix chocolate chip muffin recipe exceeded my expectations. The muffins turned out so fluffy and moist all thanks to the butter. I used the Betty Crocker lemon cake mix but you can also use Duncan Hines or Pillsbury. 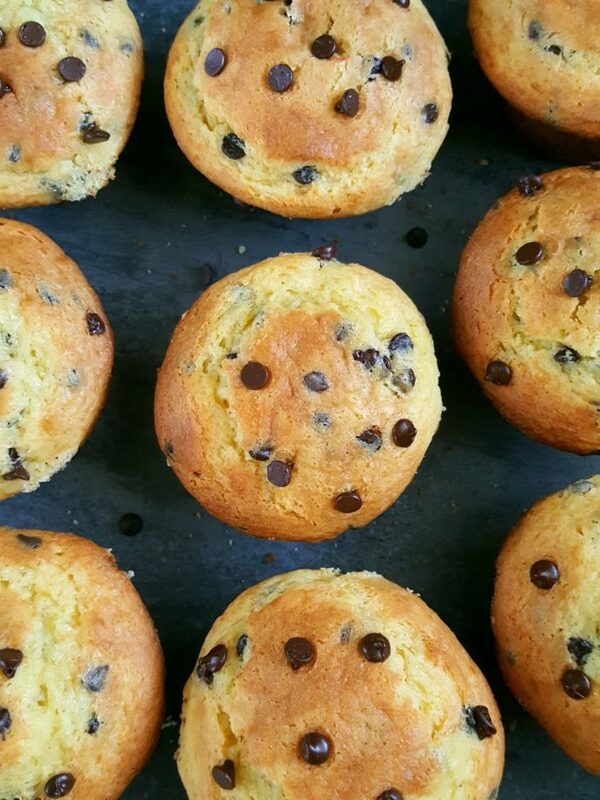 This recipe yields 12 jumbo chocolate chip muffins. 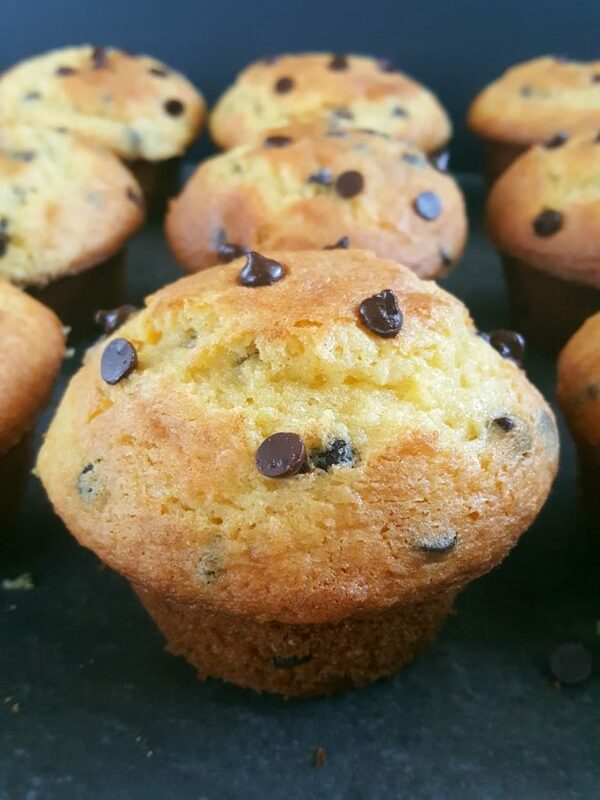 If you prefer your muffins a little smaller you can always make 16 muffins instead. Just be careful not to over bake them (since they’d be smaller in size). This is why I love baking with cake mix because there are so many things you can do with it; more than just making a cake or cupcakes. This cake mix muffin recipe may not be from scratch but it’s still homemade! And although I’m an experienced Baker, I love these kinds of easy baking recipes with few ingredients because sometimes I just feel lazy and I don’t feel like making something that requires a lot of effort. If you really love baking with cake mix just as much as I do, there are a few more cake mix recipes here on Beat Bake Eat. You should check them out! Baking at home does not have to be hard or complicated. Cake mix hacks are such Lifesavers. Never underestimate the power of a box cake mix! The next time it’s a busy morning and you’re short on time, just make some easy cake mix breakfast muffins. © Beat Bake Eat. All images & content are copyright protected. Unauthorized use and/or duplication of this material without written consent from this site’s author and/or owner is strictly prohibited. Welcome to Beat Bake Eat! Hi! 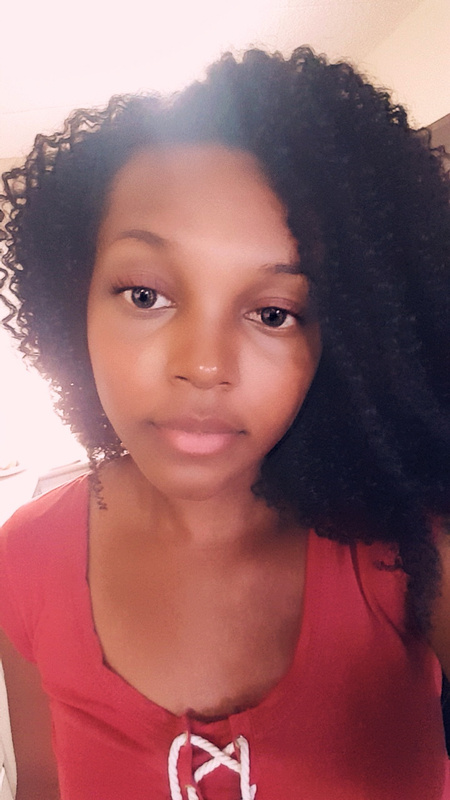 I'm Crystal - the author, photographer, and home baker behind Beat Bake Eat. This website features easy, inexpensive baking recipes that make the most of simple ingredients, that typically take 30 minutes to make. So take a look around and see what you'll find to bake your life a little sweeter.